I warmly welcome you to the reception celebrating the 64th anniversary of the founding of the People's Republic of China. 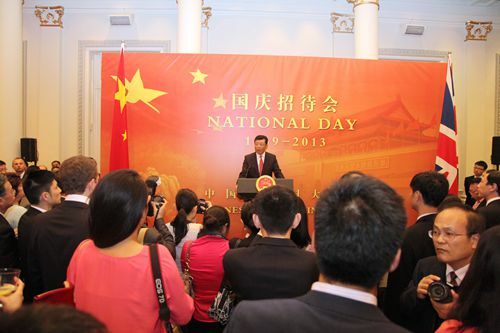 This is the fourth time I have hosted a Chinese National Day reception in UK. At each of these celebrations I have been proud and confident to review China's progress and look forward to her future. Over the past year in China there are three phrases that have been used most frequently and carry great weight. Each have provided inspiration and hope for the Chinese people. The first phrase is the 18th Congress of the Communist Party of China. · Firstly, by 2020, China's GDP and per capita income will double on the basis of the 2010 level. · Secondly, by the middle of this century, China will become a modernised socialist country that is rich, strong, democratic, culturally advanced and harmonious. In summary, the 18th Party Congress drew up a blueprint for China's development. It has drawn the entire Chinese nation together to deliver the policy objectives. There is no doubt that the 18th Party Congress will have a long and deep impact on China's future development. The second phrase that stands out is the Chinese Dream. This is a concept initiated by President Xi Jinping. It reaches into the hearts and minds of the Chinese people. The Chinese Dream inspires the revival of the Chinese nation. It means prosperity for China. Fundamentally, the Chinese Dream is all about the Chinese people. It means all Chinese can pursue and enjoy a happy life. It also means all Chinese will grow and prosper as China grows and prospers. · and a dream of advancement of mankind. A China realising its Dream will bring more opportunities to the world and make a greater contribution to the mankind. The third phrase of great note is economic transformation. China has become the world's second largest economy and one of the middle-income countries. In China there has been a heated debate on what is a sustainable economic model for China and how China can achieve economic upgrading. As the debate goes on, the whole world has been watching how China can break out of the bottlenecks and ensure sustainable growth. · and finally shift the economy from export-driven to domestic-led. Looking to the future. China has the conditions and capabilities to maintain long term, sustainable and healthy economic growth. China's development has a bright future. This was encapsulated by Premier Li Keqiang recently at the Summer Davos in Dalian. "Now the new season of the Chinese economic miracle is unveiled. This is one of better quality and higher efficiency, and I guarantee you even more exciting stories to come." The 18th Party Congress, the Chinese dream and China's economic transformation. All these trends are of vital importance to China's development. They have also provided positive energy to China-UK relations. Over the past year, China-UK relations returned to the normal track after going through some difficulties. Our cooperation in various fields advanced steadily. Chinese investments in Britain continued to grow fast. Since the beginning of last year, Chinese investments in Britain have totaled more than 12 billion US dollars. The two central banks signed a currency swap agreement worth 20 billion pounds. This is the first of its kind between China and major developed economies. Our cooperation in other fields has also been charged with highlights. 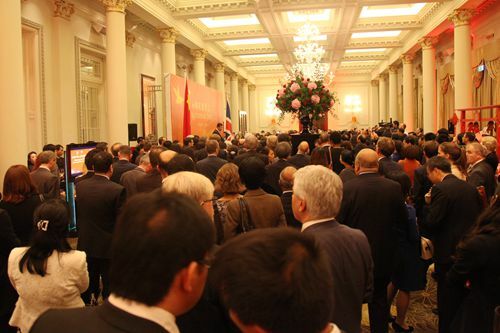 This summer witnessed a really exciting series of China-UK cultural exchanges. We have enjoyed the ballet production of Jane Eyre in London by Shanghai Ballet Company. Then there was the premiere of The Tragedy of Coriolanus by Beijing People's Art Theatre at the Edinburgh International Festival. In education, Britain has launched the Generation UK programme, which aims to send 15,000 young Britons to study or work in China in the coming three years. Just this week, Britain will have one more Confucius Institute to be opened in Aberdeen University. On top of these, I have also been moved by many touching stories of China-UK relations. In Tanzania Chinese and British engineers and workers are working closely together to build the gas pipeline that runs more than 500 kilometers from Mtwara to Dar es Salaam. When completed, this project will greatly improve the power supply and investment environment in Tanzania. This will significantly speed up local economic growth. "My experience in China was not how I anticipated and certainly had no resemblance to how certain aspects of the Western media portray it. China was amazing and I was totally blown away by it. The cuisine was second to none; the people were most welcoming and the history was so vast that it just wasn't possible to explore it all. … It was amazing. I shall definitely be visiting again and I am now learning Mandarin though it is not the easiest language to learn." The above is just a snapshot of the current China-UK relations. · and strengthen practical cooperation. If we follow these guidelines then China-UK relations will bear more fruits and write more touching stories. 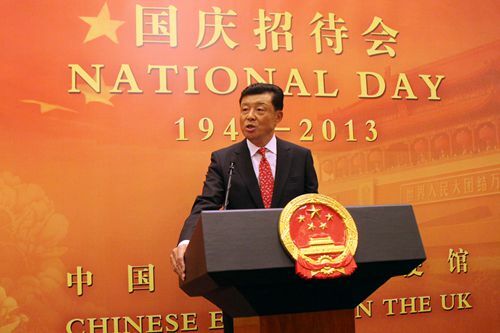 To the 64th anniversary of the founding of the People's Republic of China! To a bright future of China-UK relations! And to the health of all guests present!